I’ve had the pleasure of interviewing nearly two dozen people in the Valley and southern Arizona for the On Media Publications Arts Hero project. It’s been a labor of love during the past few months because I’ve met some of the coolest people doing amazing, righteous things for our communities. Most of the honorees are new to me. 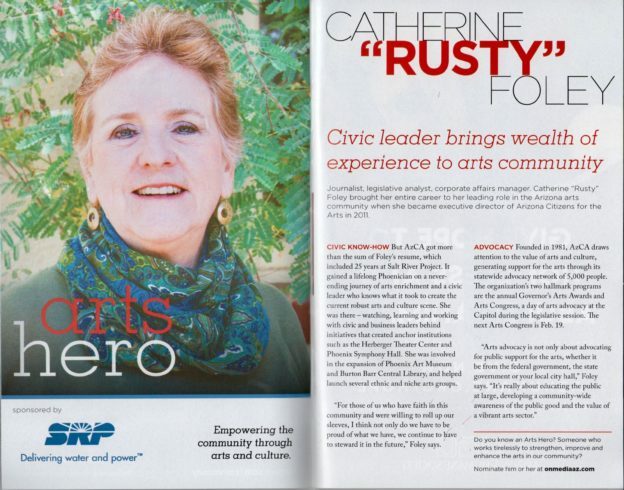 But Rusty Foley, the Phoenix Arts Hero for January, is very familiar. She built a legacy long before she put her talent and energy into Arizona Citizens for the Arts. I knew her first as a very good journalist and then as a community mover-shaker while at SRP. You can call Rusty a hero. I call her a bad chick. Not many people hold that high status in my book. This entry was posted in Arizona, Arts and culture, Community, Nonprofits, Phoenix, Uncategorized and tagged arts, civics on January 19, 2018 by Jennifer Dokes.